CommAgility, a Wireless Telecom Group company announced the CA-D8A4-RF4, a stand-alone hardware platform supporting eNodeB and UE configurations for LTE-Advanced (LTE-A) networks. The platform comes pre-integrated and tested with CommAgility's Small Cell or Mobile LTE software providing out-of-the box connectivity, thus cutting time to market and reducing risk. The CA-D8A4-RF4 has been designed for use in applications such as small cell, relay and terminal equipment, in private network markets including Citizens Broadband Radio Service (CBRS) and ground-to-air. By providing high-performance, flexible processing and interfacing, it delivers a platform that enables customers to benefit from CommAgility's world-leading experience of LTE adaptation for specialized private networks. 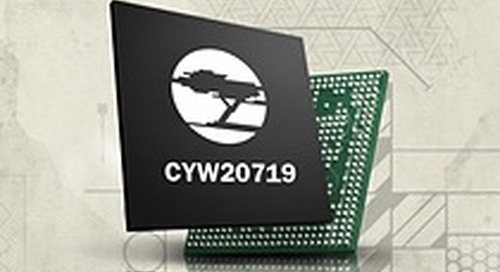 Baseband processing is performed by the TCI6638K2K System on Chip (SoC) from Texas Instruments. The CommAgility LTE SmallCell software supports an eNodeB with 120 active, 360 connected users and a throughput of up to 300Mbps downlink, 102Mbps uplink. EPC integration can also be supported to create a stand-alone network on the platform. As a terminal the mobile platform supports a Release 10 feature set with 20MHz bandwidth, 2x2 MIMO and 64QAM. Combined with CommAgility’s LTE UE software, it is ideal for highly differentiated LTE UE products that require customization. Enhancements such as extended Doppler shift and latency for high-speed, long range applications are available. The CA-D8A4-RF4 has a software-defined RF front end with four transmit and receive channels supporting bands between 410MHz and 5925MHz with bandwidths up to 100MHz, making the platform ideal for 5G new radio development. Independent front end modules support TDD and FDD modes of operation at up to +21dBm rated power output per antenna and allow easy customisation for different frequency bands or higher power outputs. The channels can be operated in 4x4 MIMO or 2x2 MIMO 2CC carrier aggregated mode. Three CPRI interfaces are provided to support remote radio head operation if required. A range of build options is available, and further customization of the platform and enclosure design is possible in volume, to enable the best technical and commercial fit to a customer application to be achieved.